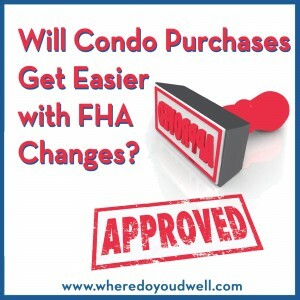 Will Condo Purchases Get Easier with FHA Changes? Can you relate to this scenario: You’re ready to buy the perfect condo for your first home purchase. And, all you need is FHA financing to make it come true since these loans permit lower down payments (3.5%) and lower FICO scores compared to conventional loans. BUT… the condo building you want to buy into is not FHA certified! What does that mean??? It means that you cannot use a FHA loan for that particular condo unit in that particular building. You can’t even use a FHA Spot Loan since they were eliminated back in 2010. FHA requirements for condos are fairly stringent, and by some estimates upwards of 50% of condo associations nationwide fail to meet FHA guidelines. You’re not the only one who has been frustrated by this type of roadblock in recent years. Both Democrats and Republicans in Congress have pushed for an easing of condo certifications since the number of condo associations completing this process has drastically dropped to 22,800 in 2014 from 93,470 in 2010. “Current FHA regulations prevent buyers from purchasing condominiums, harms homeowners who need to sell their condominiums, and limits the ability of condominium projects to attract resident buyers,” according to the National Association of Realtors in a statement to Congress. The FHA seems to be listening, and back in November it answered by implementing the first steps for a streamlined condo certification process. Will the new changes, which took effect on November 13, 2015, help you and encourage more condo associations to get certified? Still-not-enough changes: Spot Loans are still not allowed, transfer fees still face restrictions, and guidelines on condo association budgets, reserves, lease approvals, and commercial space are still rigid. Welcome changes: The recertification process has been streamlined so only certain documents need to be submitted at the 2-year expiration; the eligibility of acceptable owner-occupied units will now include second homes that are not investor-owned. Here’s a more detailed look at the 2016 FHA guidelines for condo certification. What to Expect in November 2016? Hopefully more condo associations will get certified in the coming months, and more comprehensive rule changes will be implemented by FHA when it comes out with more revisions. It seems like there is hope that more moderate-income, first-time buyers, who can’t afford a townhouse or single-family home, will be able to purchase a condo unit down the road. Contact us if you want more information on the new guidelines, a list of current FHA-approved condos in the DC metro area, and what you can do to encourage FHA to continue to revise rules so that it will encourage condo associations to go through the certification process and be approved.